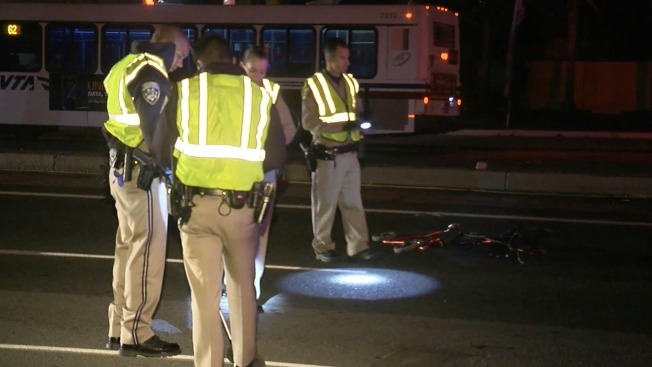 A pedestrian with a walker was struck and killed by a car in San Jose Friday night, but the victim "may have been at fault," according to the California Highway Patrol. The fatal crash happened around 9:20 p.m. near South Bascom Avenue and Scott Street, and a preliminary investigation revealed that the pedestrian "may have been at fault in this situation for stepping into traffic and crossing at a place other than where it is safe for a pedestrian to cross," CHP Officer Daniel Hill said. When officers responded to the scene, firefighters had already pronounced that the victim had died, but the driver was not present, according to Hill. The driver eventually returned to the scene and admitted that he hit the pedestrian, Hill said. He was cooperative with authorities, but he was determined to be under the influence of alcohol and arrested.